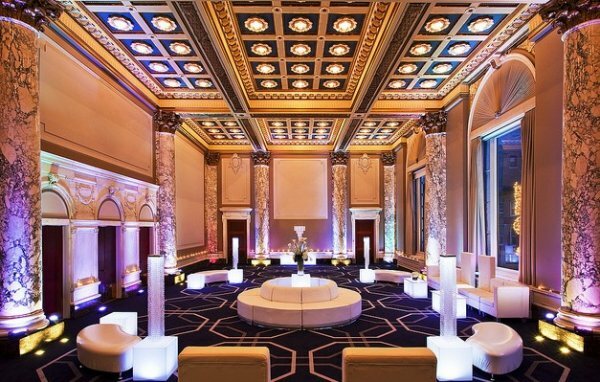 Revel in the rhythm of W New York – Union Square, located in the 1911 beaux arts Guardian Life building. Central to glamorous shopping, electric music venues and a dynamic art culture, ours is a contemporary spot for you to see and be seen. Taste Mediterranean-inspired treats at Todd English’s Olives restaurant, then get cozy in the curtained alcoves at Lilium. Or gaze at the city and people watch with a martini in hand in the Living Room. 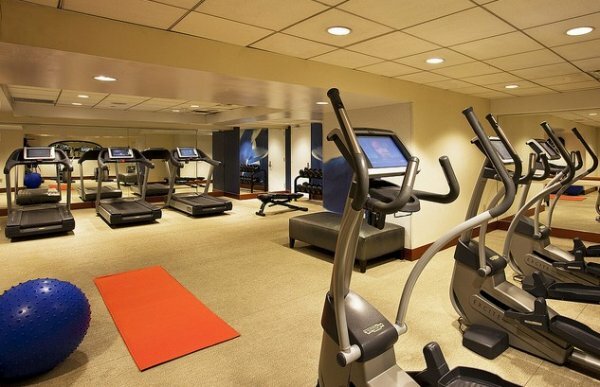 If the hectic pace isn’t getting your heart racing, SWEAT’s 24-hour fitness experience will. 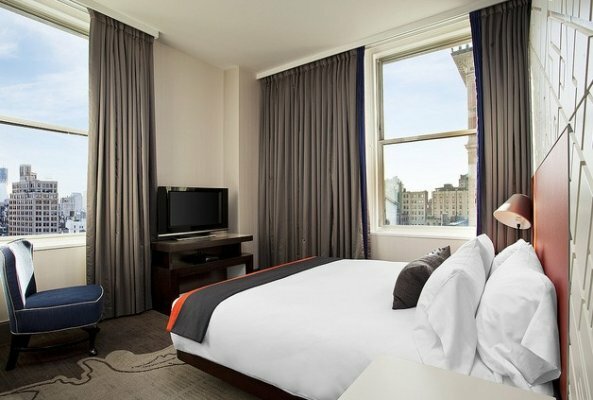 Then escape to your newly-renovated guest room to relax in our legendary bed and watch Manhattanites mingle from your colorful view of the square. Call to make an appointment before you arrive to guarantee the best appointment times. (917) 534-5818. Spa treatments available in your guest room only. All three services can be made with only one (1) hour’s notice and are available only in your guest room. Cancellations must be made six (6) hours in advance, otherwise full price is charged to guest for the time reserved. Who feels like a workout? Tone your body. Free your mind. 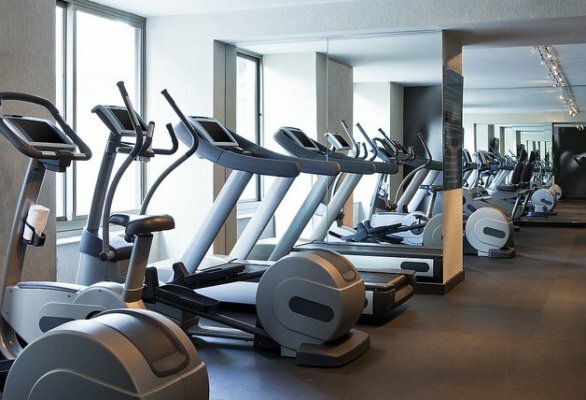 Work out with state-of-the-art aerobic equipment and body toning dumbbells at Sweat® Fitness Center. Nothing relieves the soul like a little bit of exercise, and at SWEAT there’s always plenty to choose from. Conveniently open 24 hours. Woof/Meow! Who loves your pet? We think the furry friend you love should travel in luxury with you. That’s why at W New York – Union Square, Pets Are Welcome. 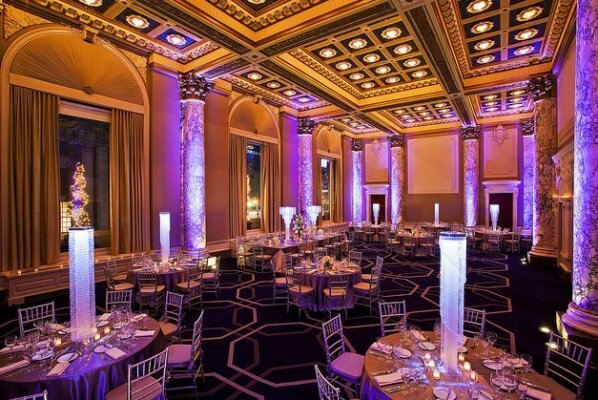 Perfect for work and play, W New York – Union Square offers everything you need to make your business beautiful, meeting memorable, and special event spectacular. 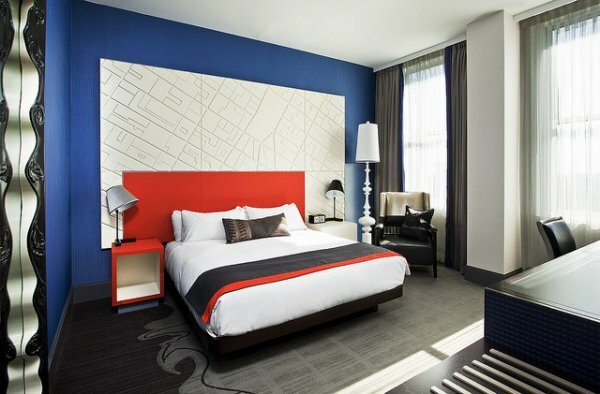 Creative in approach and innovative in design, W New York – Union Square is a breath of fresh air for your attendees. 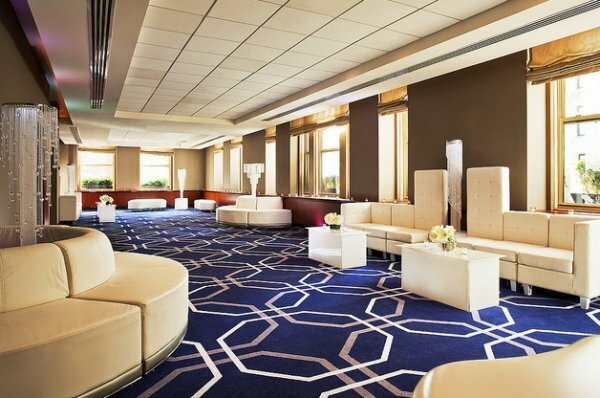 More than 7,000 square feet of conference facilities on the second and mezzanine floors await you. Choose from seven state-of-the-art meeting rooms. Groups will find our four studios perfect for a breakout or small reception. Welcome your guests in our 880 square foot Gathering Place. Then, wow them in the amazing Great Room at 2,300 square foot with a 23 foot ceiling, replete with turn-of-the-century grandeur and original detailing from the 1911 Guardian Life Beaux-Arts Building. Delectable dishes provided by award-winning Todd English’s Olives takes the fabulousness to a whole new level. Energize in a vibrant spectrum of colors and textures. Finish the day’s business in no time at the ergonomic workspace. Make a shout-out with the cordless and connect via High Speed Internet Access. When it’s time to play, fire up the 42” flat screen television with a DVD from the media collection or hook up to the iPod® docking station. Snack from the Munchie Box and sip from the mini bar. Call for in-room dining 24 hours a day; our Whatever/Whenever® Service can handle anything else. Retreat to a peaceful sleep in the W Signature Bed—one king or two doubles. 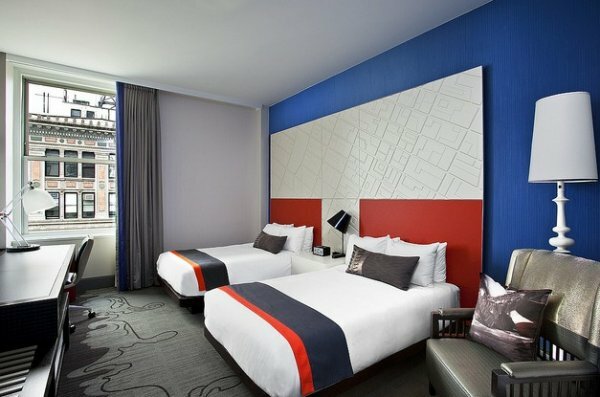 Our custom pillow-top mattress is layered with a featherbed and down duvet, and accented by plump down pillows and a headboard that winks at the electrifying contrasts of the surrounding neighborhood. Wake up to discover a new level of perfection: Bliss Spa® lemon + sage sinkside six Bath Amenities and our soft terry robes. 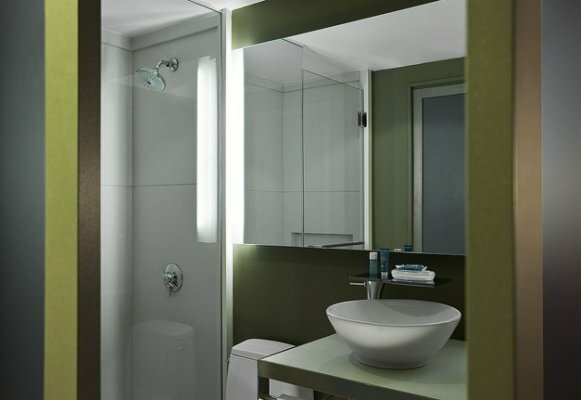 Opt for a standing shower in a Wonderful Room with a king bed, or get a combination shower/tub in a double-bed room. 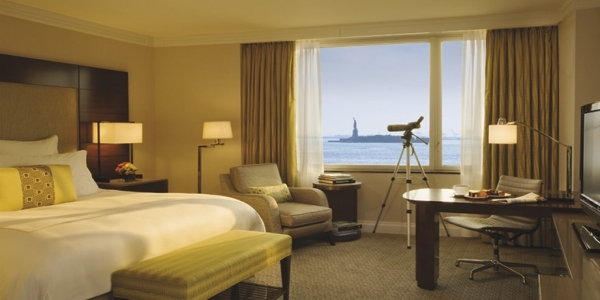 Absorb the energy of Manhattan or the park through your Spectacular Room’s expansive window. Let in the light to illuminate the fresh design by d-dash and Wilson. Keep on top of your workload at the ergonomic desk. Stay connected with High Speed Internet Access and dual-line phones (one is cordless). After hours, get your pop-culture fix via the iPod® docking station or the 42” flat screen television complemented by our thorough media collection. 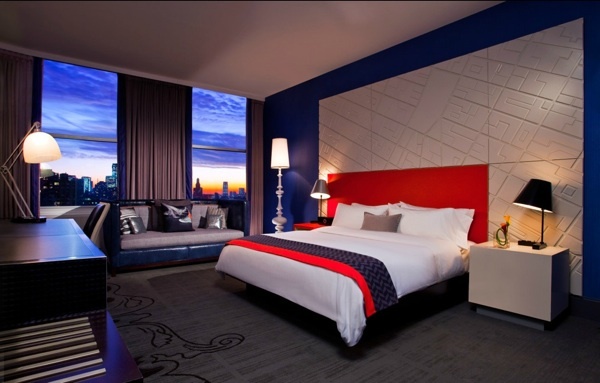 Any time the mood strikes, the Munchie Box and mini bar are nearby, or dial up our 24-hour in-room dining. If you need anything else, just ask our Whatever/Whenever® Service. 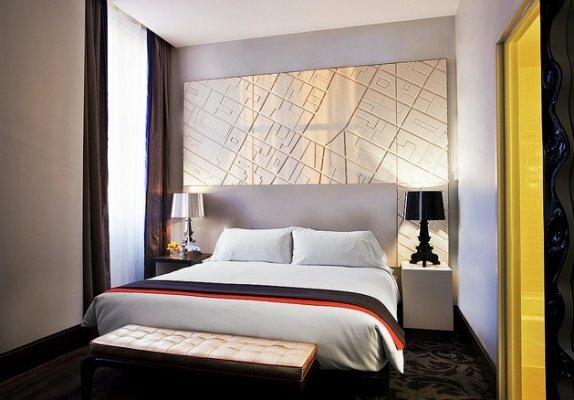 Collapse into the W Signature Bed comprising our custom pillow-top mattress, featherbed, 350-thread-count linens and down duvet. Unwind in a standing shower if you have in a Spectacular Room with a king bed, or jump in the combination shower/tub in a double-bed room. Then refresh with the legendary Bliss Spa® lemon + sage sinkside six Bath Amenities and warm up in a plush terry robe. Scan across Union Square Park to keep tabs on the goings-on of the day. Light up your ample space that boasts the bursting colors of d-dash and Wilson’s cutting-edge design. Clear the day’s business at the ergonomic desk with dual-line phones (one is cordless) and High Speed Internet Access before mixing cocktails at the mini bar. 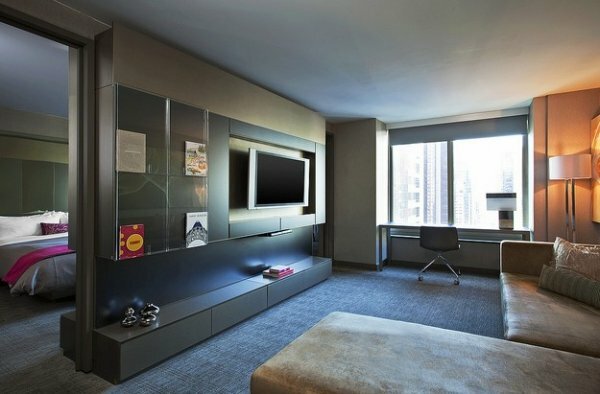 Recharge in front of the 42” flat screen television, Munchie Box snacks in hand, or plug in to the iPod® docking station. Ring our Whatever/Whenever® Service to pick a flick from our media collection, or let 24-hour in-room dining deliver a dish to satisfy your taste buds. Sink into a king-size or two double W Signature Beds, with 350-thread-count linens draped over our custom pillow-top mattress, as well as a down duvet and goose down pillows. Relish the comforts of the legendary Bliss Spa® lemon + sage sinkside six Bath Amenities and soft terry robes after emerging from the combination shower/tub. 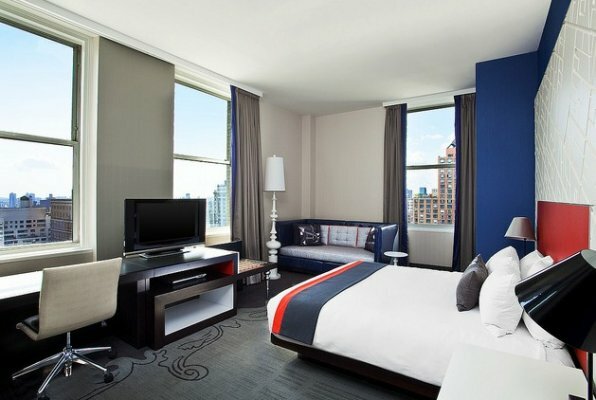 Soak up Union Square Park or Manhattan views worthy of a room called Fabulous. Energize in d-dash and Wilson’s dynamic palette of colors lit up via the oversized window. Make quick work of the day’s business at the ergonomic workspace, complete with a dual-line cordless phone and wireless High Speed Internet Access. Take a break or get fully settled in the daybed or pullout sofa. Snack from the Munchie Box and sip from the mini bar while getting lost in a movie on the 42” flat screen television. Call for in-room dining 24 hours a day, and our Whatever/Whenever® Service can handle anything else. 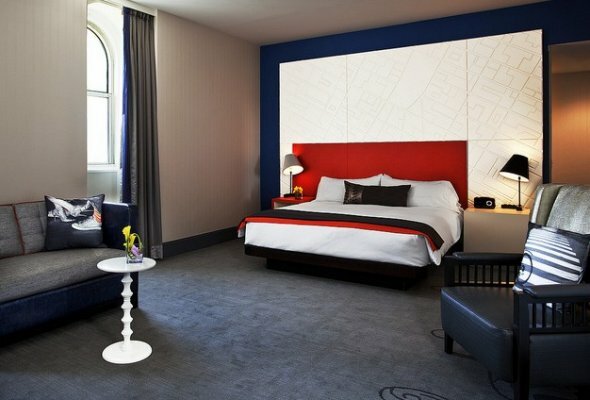 Switch off the eclectic lamps atop converse nightstands and recharge overnight in the king-size W Signature Bed. 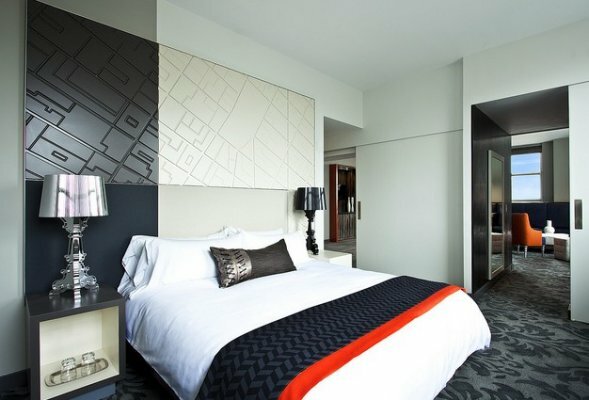 Lose yourself amid the custom pillow-top mattress, 350-thread-count sheets, down duvet and goose down pillows. Then prep for the day ahead in the vibrant bathroom, equipped with a combination shower/tub and stocked with the signature Bliss Spa® lemon + sage sinkside six Bath Amenities and plush bathrobes. Tear yourself away from your exclusive view of the park or city to discover a creative collision of contrasting materials. 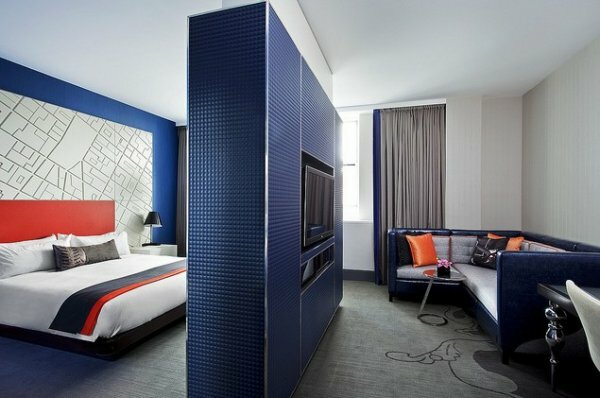 Remixing high white walls inspired by elegant Park Avenue apartments with metallic blue walls that recall downtown’s visionary bohemian vibe, Studio Suites amplify the hotel’s visionary location. Wake to glamorous silver drapes stitched to fabric traditionally used for men’s ties via a vibrant thread. And encounter bold Beaux Arts details in the carpet, which evolves into an oversized graphic running down the side of the room. Empty your inbox at the ergonomic workspace. Stay connected with High Speed Internet Access and dual-line phones (one is cordless). At quitting time, get your pop-culture fix via the iPod® docking station or the 42” flat screen television complemented by our thorough media collection. 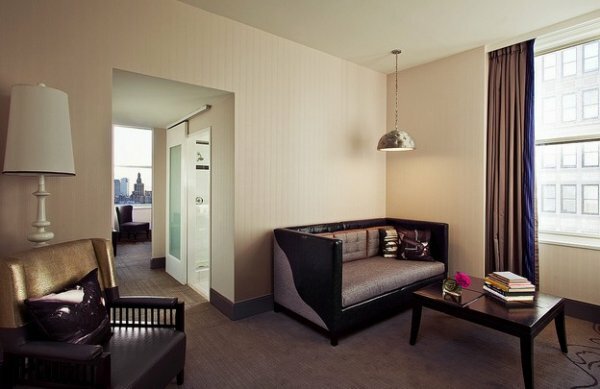 Venture off the pullout sofa toward the Munchie Box or mini bar when the mood strikes, or dial up our 24-hour in-room dining. If you need anything else, just ask our Whatever/Whenever® Service. On either side of the king-size custom pillow-top W Signature Bed, converse nightstands house eclectic lamps. 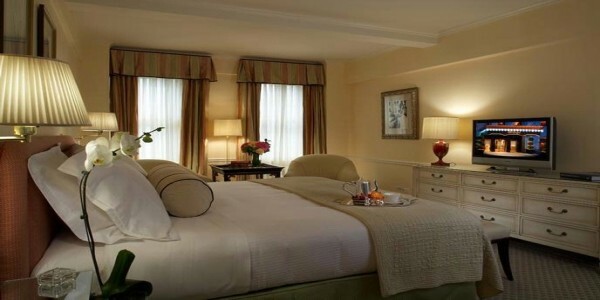 Tuck into the 350-thread-count sheets and down duvet, topped with goose down pillows, for an energizing night’s sleep. Revel in the bright bathroom, stocked with the Bliss Spa® lemon + sage sinkside six Bath Amenities and plush terry bathrobes. Live large in a Cool Corner Suite, where an oversized mirror and unexpected design details wink at the dynamic contrasts of the surrounding Union Square area. Open your oversized window’s curtains and illuminate the spacious separate living room, which boasts bright colors and innovative design courtesy of d-dash and Wilson. Stay industrious at the ergonomic workspace with a cordless dual-line phone and wireless High Speed Internet Access. Retire to the day bed after making a cocktail at the mini bar. Bask in the glow of the 42” flat screen television, Munchie Box snacks in hand, or hook up to the iPod® docking station. Ring our Whatever/Whenever® Service to pick a flick from our media collection, or let 24-hour in-room dining deliver a dish to satisfy your taste buds. Choose between the separate shower and bathtub, indulge in the Bliss Spa® lemon + sage sinkside six Bath Amenities, then wrap up in our superior terry bathrobe before retreating to the separate bedroom. 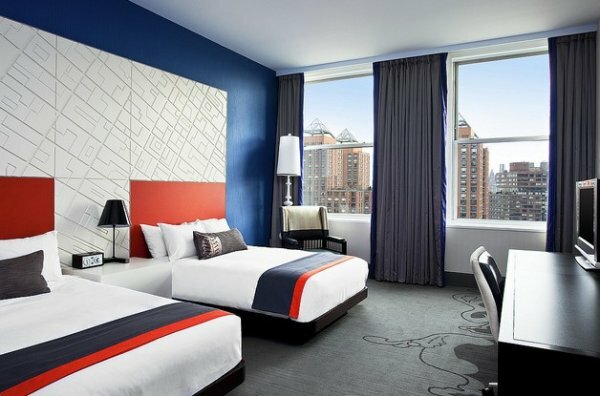 Sink into the king-size W Signature Bed—lavishly adorned with a plush pillow-top mattress, 350-thread-count sheets and goose down duvet and pillows—and gaze at the 42” flat screen television. Unveil the Union Square Park views that justify the Fantastic Suite’s nomenclature. Amplify d-dash and Wilson’s interior design with sunlight through the large window. Chip away at your workload on the ergonomic desk, outfitted with a dual-line cordless phone and wireless High Speed Internet Access. Crash on the daybed and drift away to the tunes from the iPod® docking station. Snack from the Munchie Box, sip from the mini bar or call for in-room dining 24 hours a day. Then dip into our Whatever/Whenever® Service’s media collection and watch DVDs on the living room’s vivid 42” flat screen television. Or swivel the TV around to the bedroom, and be wooed by the king W Signature Bed’s custom pillow-top mattress, 350-thread-count linens, down duvet and goose down pillows. Release your stress in the separate shower or bathtub, try out the legendary Bliss Spa® lemon + sage sinkside six Bath Amenities, and ensconse yourself in a soft terry robe. Celebrate full park views from the comfort of a Wow Suite’s sprawling living room—a creative collision of textures and colors by d-dash and Wilson. Host a gathering of your nearest and dearest, thanks to ample couch seating and a convenient half-bathroom. Raid the Munchie Box or mini bar for sustenance, or order up in-room dining any time of day or night. Entertain yourself and others via the iPod® docking station or the 42” flat screen television set in a state-of-the-art audiovisual center. Peruse our Whatever/Whenever® Service’s media collection. When work has to trump play, plow through your inbox at the ergonomic desk, complete with High Speed Internet Access and a cordless dual-line phone. Dream big in the king-size W Signature Bed—our custom pillow-top mattress, 350-thread-count sheets, down duvet and goose down pillows—amid the glamorous fabrics, modern accents and additional 42” flat screen television in the separate bedroom. Then awake and get ready in the master bathroom, equipped with a separate shower and tub, and indulge in the legendary Bliss Spa® lemon + sage sinkside six Bath Amenities and a plush terry robes. Want for absolutely nothing in this dynamic expression of d-dash and Wilson’s visionary aesthetic. 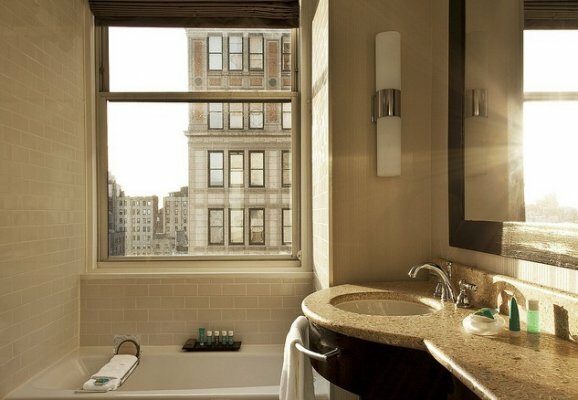 Gaze upon the Union Square expanse through the Extreme Wow Suite’s generous windows that allow radiant sunlight and glittering starlight. 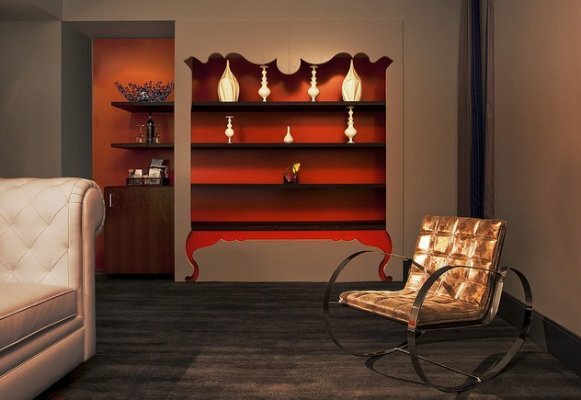 Convert the innovative wall unit as you see fit. Seat six for dinner or entertain a crowd by using it as a DJ booth. Be as inclusive as you like thanks to extensive couch space and a half-bathroom. Ring our Whatever/Whenever® Service to pick a flick from our media collection and play it on the home theater system’s 42” flat screen television. Let guests snack on Munchie Box favorites and discover new concoctions at the mini bar—or call up a feast from 24-hour in-room dining. If needs be, stay industrious at the ergonomic workspace with a cordless dual-line phone and wireless High Speed Internet Access. Gain a new perspective from the oversized mirror that reflects the bold master bedroom, equipped with its own 42” flat screen television. Drift away in the king-size W Signature Bed’s custom pillow-top mattress, 350-thread count linens, down duvet and goose down pillows. Let your hair down in the Jacuzzi or shower, complemented by the legendary Bliss Spa® lemon + sage sinkside six Bath Amenities, then get cozy in a soft terry robe. Discover a pulsating cave of wrought-iron lilies. Designed by Gulla Jonsdottir of G+ Design, Lilium’s nature-inspired 1,600-square-foot interior blends visionary twisted metal—cascading from the ceiling, down the walls—with black-steel lilies sculpted by renowned artist Scot Brown. Contoured wood and gold accents elevate raw elements, evoking a seductive energy and exciting intimacy, while up-and-coming DJs amplify the scene with classic and modern rock. Take your pick of the bar’s craft beers, custom cocktails, and boutique, small-batch spirits, including bourbons by Elijah Craig, Woodford Reserve, Hudson Baby Bourbon and Kings County. And savor small bites like grilled sirloin skewers, bistro fries, risotto tater tots and assorted cheeses from the menu by Todd English. Private event space is available. Who wants flavor? After gaining critical acclaim in culinary excellence for his “Olives” restaurants in Boston, Washington, and Las Vegas, famed Chef Todd English delights the taste buds once again. Welcome to “Olives” New York – located inside the W New York – Union Square. Relying on wood ovens and open wood fires, Olives offers a deliciously rustic, American rendition of Italian and Mediterranean cuisine. This two story, 100-seat restaurant is a sophisticated blend of old and new. 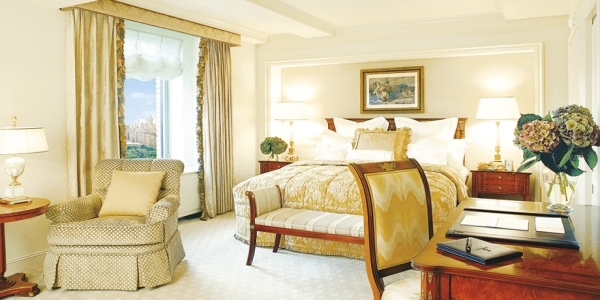 Oriental carpets with warm colors set on wood floors and banquettes with stunning park views. Grab a drink in our lively bar area. Observe who’s there. And see how it’s all done. There’s an open kitchen with a fireplace rotisserie. Where do you lounge? What others call a lobby, we call our Living Room. A revolutionary open space complete with cozy seating where you can relax, and sip an evening cocktail. Mingle. Read. Challenge your intellect. Or challenge someone new to play at one of our specially designed game tables. Style is in our nature. 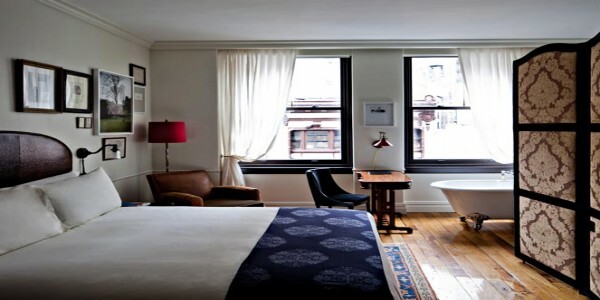 The W New York – Union Square Living Room features 16 foot arched windows overlooking the park with topiary walls filled with plants and flowers. Welcome. Relax. Stay a while. Hours:	11:00 AM – 12:00 AM.